BERMUDA PAINTINGS: Bermuda paintings by American artists working between 1875 up to about 1925.
www.marklasallefineart.com has an ever changing inventory of Bermuda paintings and over the past fifteen years has owned a vast number of works of Bermuda subject matter. We are always interested in acquiring works of Bermuda subject matter. Please check out our page of Wanted to Buy works on this site in case you have works of art for sale. It is only a partial list and is added to frequently as we develop our site. If you are thinking of selling your paintings at auction, please contact us after you have received estimates from an auction house. There is a strong chance that we would pay more than the auction estimate and provide immediate payment for your work of art, thereby reducing your risks of selling at auction and running into the possibility that your paintings fail to sell. All of the works that you see on this www.marklasallefineart.com are for sale, unless they are previously sold or they are "on hold." If you have an interest in any work on the site, please email us using the contact page and we will get back to you as soon as possible. Thank you for looking and check back often as we are adding new works all the time. Copyright 2017-2018. All images are copyrighted and no image may be reproduced without the express written consent of Mark LaSalle Fine Art. 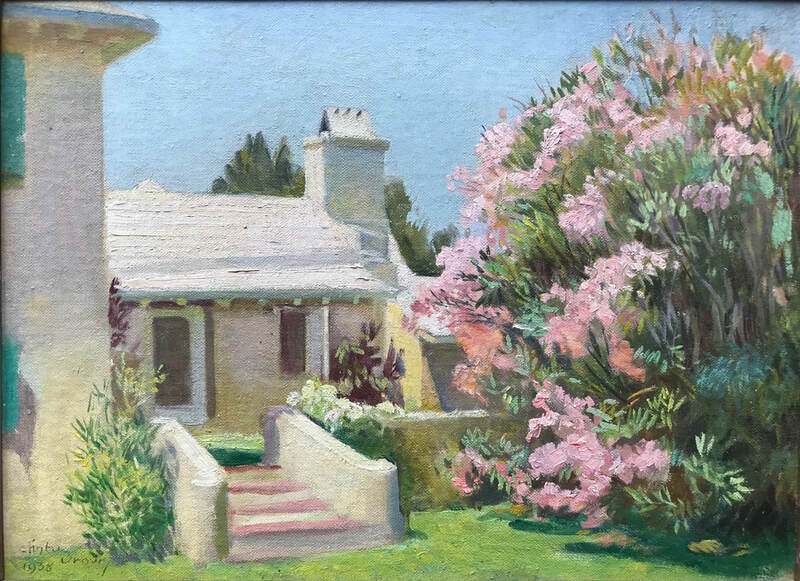 Clinton Brown (American, died 1954) Bermuda House with Oleander in Bloom, 1938 Oil on canvas board 9.50 x 13 inches Signed and dated lower left: Clinton Brown, 1938 Original estate condition, original frame Clinton Brown (a.k.a. Michael Clinton) was an American impressionist painter who visited Bermuda in 1937, 1939, 1947, 1949 and later. 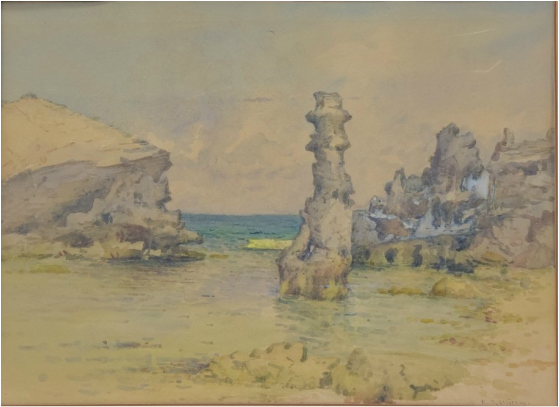 He specialized in landscape and floral paintings and exhibited paintings of Bermuda at Sandys Parish Flower Show at "Cambridge" in Somerset, 1947, where he took home 1st and 2nd prizes. In 1953, he exhibited with the Society of Arts in Bermuda, and again in 1954. House by the Harbor, Bermuda 1938 - by Mary Townsend Mason (American, born 1886). Pastel and pencil on paper, mtd. on board, 12 x 16 inches. Signed, dated and inscribed Bermuda, 1938 lower left. Excellent original condition, unframed. Price: $3,800.00. Biological Station - Fairyland, Bermuda. Liverpool Joe's Residence, Circa 1907 by J. Warren Sheppard (American 1858-1937). Pen and Ink on paper, 6 x 12.25 inches. Signed lower left: J.W.S. (monogram). Titled on the recto, in the artist's hand. Pristine condition, framed. Ross Sterling Turner (American 1847-1915) - A Bermuda Cedar Tree, 1891. Watercolor and gouache on paper, 19 x 15 inches. Signed and dated lower right, and inscribed: Bermuda. Original condition, framed. 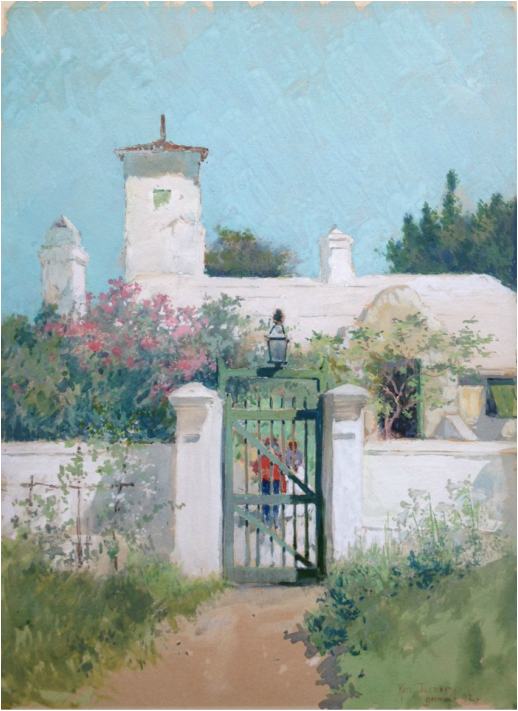 Ross Sterling Turner (American 1847-1915) - The Green Gate, Bermuda, 1892. Watercolor and gouache on paper, mtd. on board, 14 x 10 inches. Signed and dated lower right: Ross Turner, 1892, and inscribed Bermuda. Pristine condition, framed. Ross Sterling Turner (American 1847-1915) - A Garden by the Sea, Bermuda, Circa 1890's. Watercolor and gouache on paper, 14 x 10 inches. Signed lower left: Ross Turner, and inscribed: Bermuda. Pristine condition, framed. Joseph Pierre Birren (American 1864-1933) -The Governor's Gate, Bermuda, Circa 1919 - Oil on canvas, unlined. 20 x 24 inches. Signed lower right: Jos. Pierre Birren. Excellent original condition, framed. Ernest Nathaniel Townsend (American 1893-1945) - Bermuda Waters, Circa 1921. Oil on canvas, unlined. 20 x 24 inches. Signed lower right: Ernest N. Townsend. Titled verso in the artist's hand. Excellent condition, framed. Hanna Rion (American 1874-1924) - Bermuda House and Gardens, Circa 1900. Oil on artist's board, 14 x 14 inches. Signed lower left: Hanna Rion. Excellent condition, framed. Isabel Lusty Sim (American 1876-1941). A Street in the Town, Bermuda, Ca. 1917. Oil on board, 8 x 10 inches (sight size). Titled and signed on the original label verso. Original condition, framed. Exhibited at the Troy Public Library, January, 1918. Sim studied with Kenyon Cox and William Merritt Chase in New York City. Eleanor Abrams (American 1885-1967) - View toward Somerset, Bermuda. Painted circa 1920's. Oil on canvas, mtd. on board. 10 x 14 inches. Signed lower left: Eleanor Abrams. Pristine condition, framed. Henry Webster Rice (American 1853-1934) - St. John's Hill, Bermuda, Circa 1910. Watercolor on paper, 14 x 20 inches. Signed lower left: Henry W. Rice. Original condition, original frame. Mark LaSalle Fine Art specializes in 19th and early 20th century American and European paintings, Bermuda paintings and other tropical locales, Lake George, the Adirondacks and the Catskill Mountains, works of art by Walter Launt Palmer, as well as Arts 'n Crafts pottery, prints and other works of art, including select contemporary works by David Coughtry and Richard Yaco. We also deal in art related books and distinct frames of the period. Images of any works of art can be sent on request. Mark LaSalle has been dealing in original works of art since 1984. We maintain a vast inventory of original works of art and our inventory is added to all the time. Inquiries are welcome. Please contact us for terms and conditions of sale. Contact us at: mlasalle@nycap.rr.com. Edmund Henry Garrett (American 1853-1929) - Bermuda Landscape with Houses, 1894. Watercolor and gouache on paper, 14 x 20 inches. Signed lower left: Edmund H. Garrett/Bermuda. Excellent condition, framed. Henry Martin Gasser (American 1909-1981) - Lazy Afternoon, St. George, circa 1950. Watercolor and gouache on paper, 8 x 10 inches. Signed lower right: H. Gasser/St. George. Original condition, original moulding. Evelyn Bicknell (American 1857-1936) - Afternoon Conversation, Bermuda. Watercolor on paper, 9 x 13 inches. Signed lower left: E.M. Bicknell. Excellent condition, framed. Evelyn M. Bicknell (American 1857-1936) - Admiralty House, Clarence Hill, Bermuda. Watercolor on paper. 10 x 14 inches. Signed lower right: Evelyn Bicknell. Excellent condition, unframed. Evelyn Bicknell (American 1857-1936) - Limestone and Cedars, Bermuda. Watercolor on paper, 12 x 18 inches. Signed lower left: E.M. Bicknell. Excellent original condition, framed. Mary Bacon Jones (American, born 1868) - Garden of the Former Home of the American Consul, Bermuda. Watercolor on paper, 7 x 10 inches. Signed lower right: Mary B. Jones. Titled verso, in the aritst's hand. Original condition, framed in the original moulding. Gustave Cimiotti (American 1875-1969)- Calla Lillies and Houses, Bermuda. Oil on canvas, 25 x 30 inches. Signed lower right: Cimiotti. Excellent condition, framed. 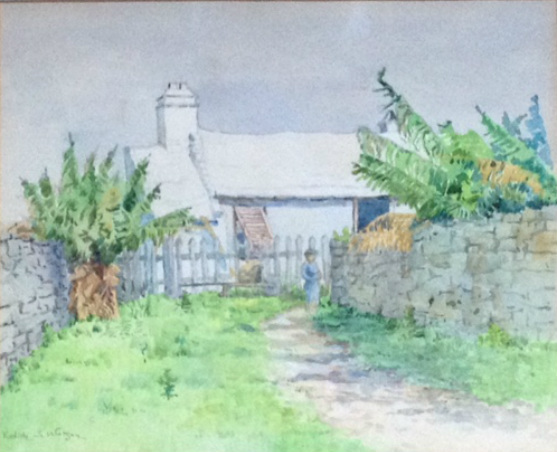 Gustave Cimiotti (American 1875-1969)- Cottage at Devonshire, Bermuda. Oil on canvas, mtd. on board, 16 x 20 inches. Signed lower right: Cimiotti. Signed and titled verso, in the artist's hand. Excellent condition, Period Newcomb-Macklin moulding. Gustave Cimiotti (American 1875-1969)- The Red House, Bermuda. Oil on canvas, mtd. on board, 16 x 20 inches. Signed lower left: Cimiotti. Titled and signed verso, in the artist's hand. Excellent condition, period Newcomb-Macklin moulding. Edith Sara Watson (American 1861-1943) - Figure on a Path, Bermuda. Watercolor on paper, 9 x 12 inches (sight size). Signed lower left: Edith S. Watson. Original condition, original moulding. Edith Sara Watson (American 1861-1943) - South Shore, Bermuda. Watercolor on paper, 11 x 15 inches. Signed lower right: E.S. Watson. Original condition, original moulding. 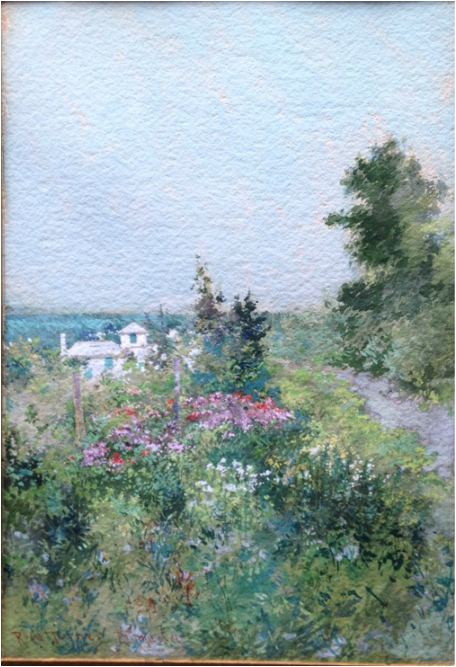 Mabel E. Dickinson Pond (American 1869-1960) - Bermuda House, Oleander in Bloom and Figure. Watercolor and gouache on paper. 10 x 10 inches. Signed lower right: Mabel E. Dickinson Pond. Original condition, original frame. Mabel E. Dickinson Pond (American 1869-1960) - View from Spanish Point, Bermuda, Circa 1920's. Oil on canvas, mtd. on board. 8 x 10 inches. Signed Mabel E.Dickinson Pond. Original condition, framed. (One of two works in inventory by the artist. Lester Baker (American, 20th century) - A Bermuda Courtyard, St. Georges, 1947. Watercolor on paper, 20 x 14 inches. Signed lower right: Lester Baker, '47. Original condition, framed. J. Winthrop Andrews (American 1879-1964) - Shore Shore, Bermuda, Circa 1920. Oil on canvas, untouched condition, 16 x 20 inches. Signed: J. Winthrop Andrews. Estate condition, Unframed.